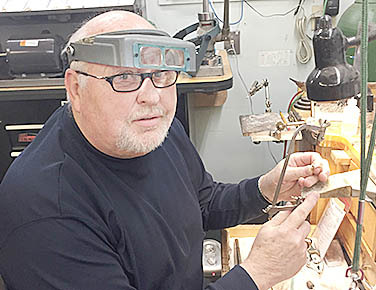 Heartland Jewelry owner Dan Willis repairing jewelry at the Albion store. Beginning in April 2007, Dan and Jeri Willis of Aurora brought Heartland Jewelry to Albion in a trailer every Wednesday. This satellite mobile jewelry repair trailer was parked in a vacant lot where the Albion Veterans Club stands today. The Willis’ have owned and operated the Heartland Jewelry store in Aurora, NE, since 1995. As the need and demand for jewelry repair, fine jewelry and gifts grew in Albion, the Willis’ decided to expand their business. In October 2007, they moved into a small building at 309 West Church Street. This move allowed them to upgrade their service to Albion by providing not only jewelry repair, but also gifts, boutique items and fine jewelry. In 2013, Heartland Jewelry moved to its current and larger location at 354 W Main Street between Albion ThriftyWay and Timeless Floral and Rentals. With this change in location, they have been able to better serve the Albion area and surrounding communities. They offer a variety of gift items such as jewelry boxes, banks, children’s items and clocks, plus a boutique section with: purses, wallets, scarves, watches and more. Read more in the April 5 Albion News print and e-editions.